A growing number of landlords who rented out their homes are at risk of being unable to return deposits to tenants seeking to move out amid declining sales due to stringent curbs on property speculation. Many of them bought their homes by taking out loans and were able to cover the purchase price by renting them out through jeonse or Korean-style deposit leases. According to the Korea Housing and Urban Guarantee Corporation (HUG), which guarantees deposits paid by tenants, 142 defaults on deposits were reported during the first six months of this year, up from 33 during the same period of 2017. Ads for sales of apartments are displayed in an apartment complex in Seoul on Monday. Most defaults occurred in Gyeonggi Province and nearby metropolitan areas like Incheon, Siheung, Hwaseong and Dongtan, which saw an oversupply of new homes. Given that only a few tenants signed up for the scheme to guarantee their deposits, there would be many more tenants who are unable to get their deposits back. "Many people leveraged to purchase homes as an investment by getting loans without their own money, expecting profits from skyrocketing home prices over the last few years," said Park Won-gap of KB Bank. "There need to be legal measures to protect tenants' deposits," he added. 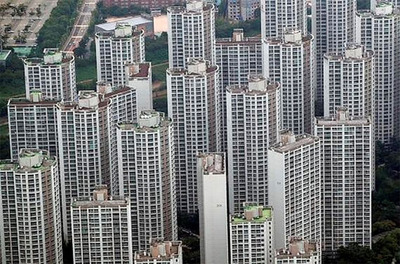 The Korea Appraisal Board forecast in a recent report that jeonse and apartment prices across the nation will drop in the second half of this year along with an increase in empty homes, with the trend expected to be especially noticeable in the outskirts of Gyeonggi Province and other provincial areas.